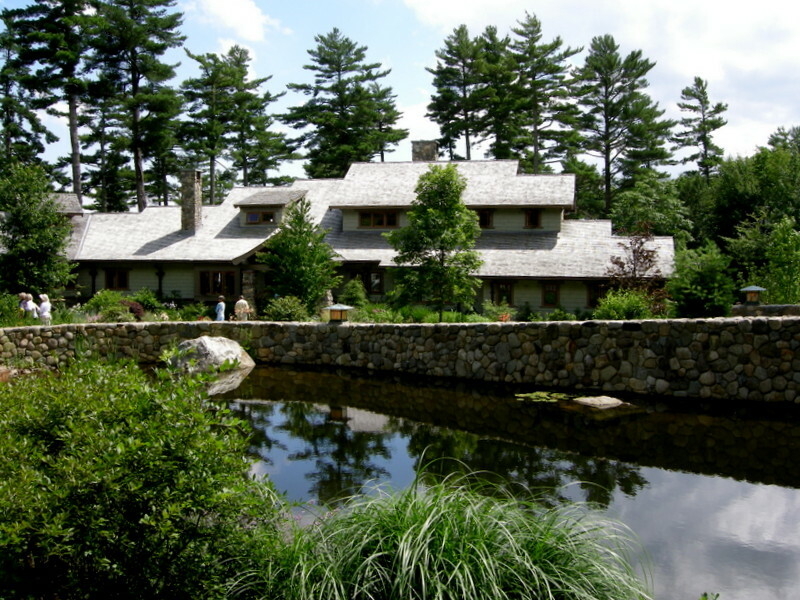 The newly built Arts and Crafts style house at the final garden on the tour is reached via a long drive ending in an elaborate stone bridge and pond. 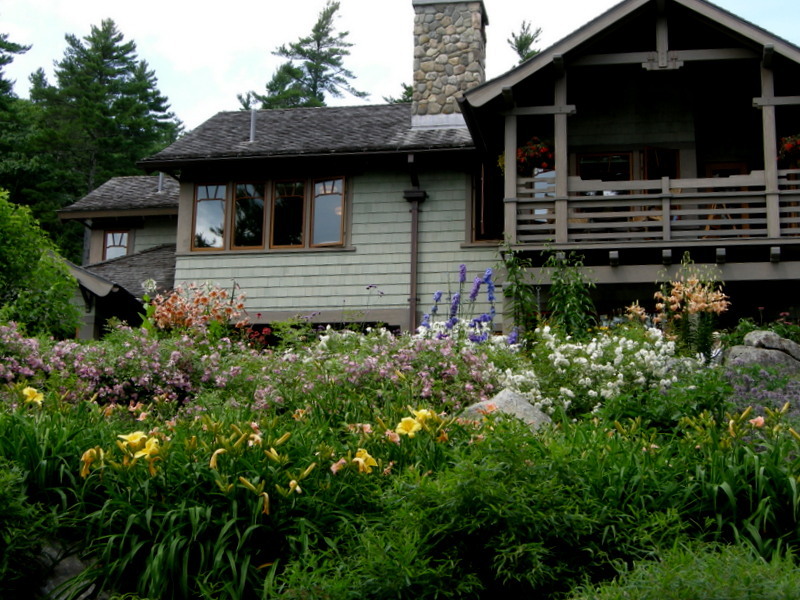 This post is the fourth in a series of posts on the Camden House and Garden Tour put on annually in mid-July by the Camden Garden Club. To read the first three posts, click here, here, and here. Next year’s tour is on July 16, 2015, and will consist of historic houses in Camden. 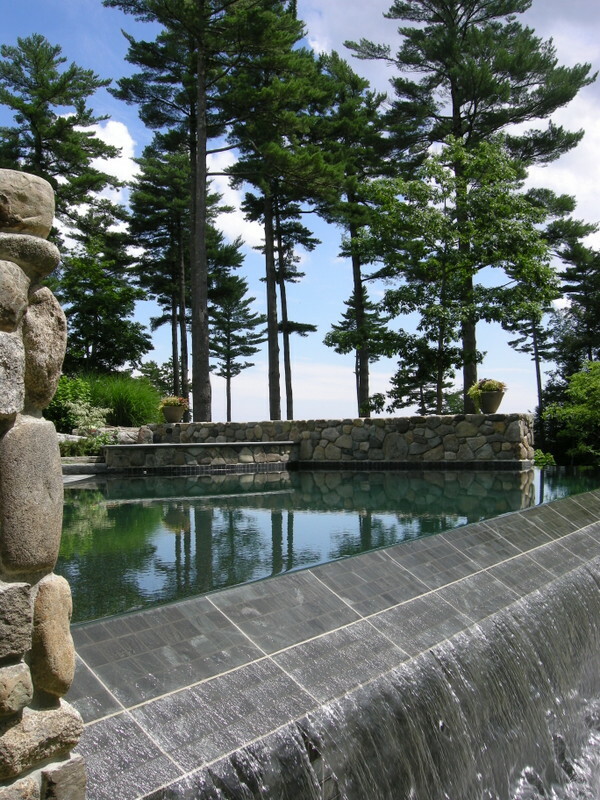 The entrance walk crosses a large stone slab that acts as a bridge over a boulder strewn stream. An elegant planter on the entrance walk. 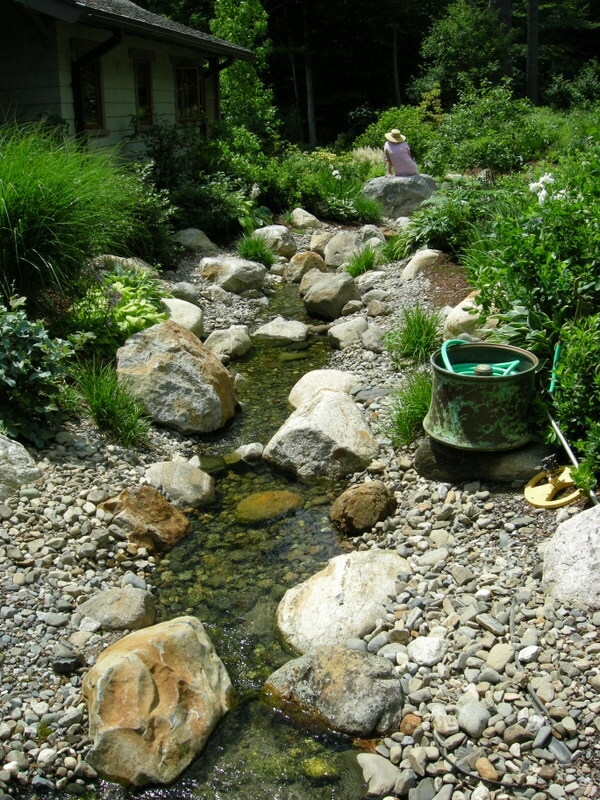 A man made stream runs along the front of the house under the entrance path. The stream ends in this pool. Behind it you can see the stone bridge and above that the guest house. 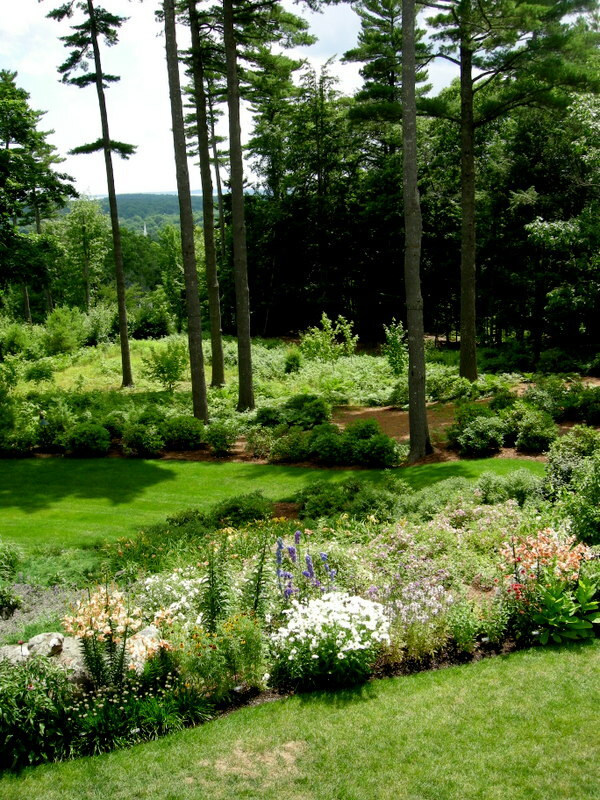 Hillside perennial garden with native woods in the background. Looking down from the balcony onto the pool area. 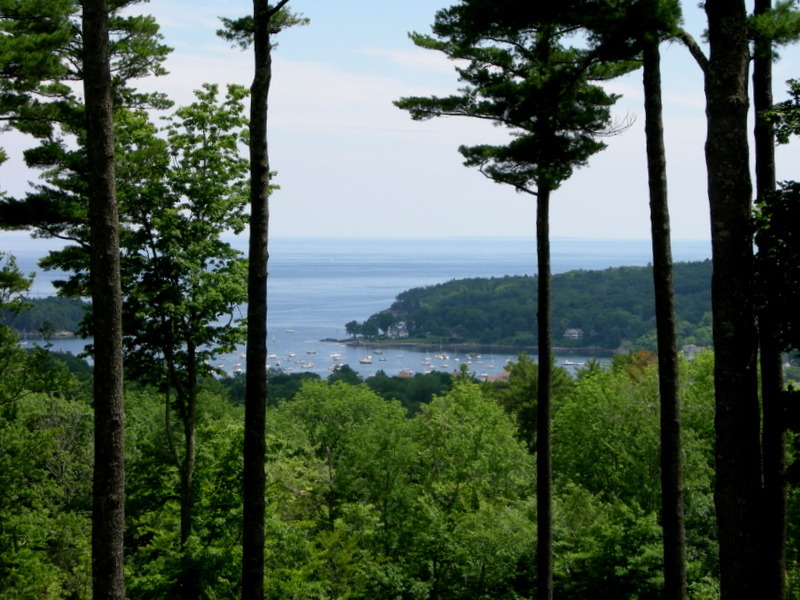 View of Camden Harbor from the master bedroom. 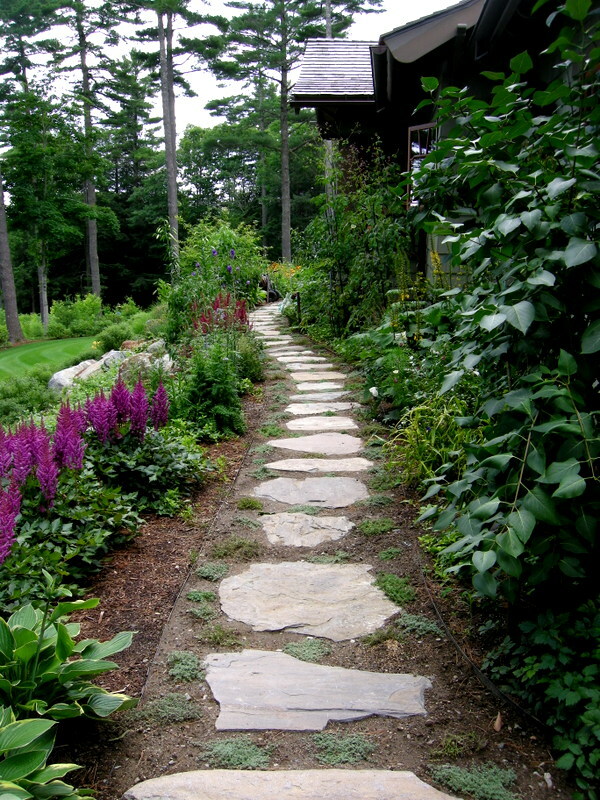 Stone path leading around to the back of the house. 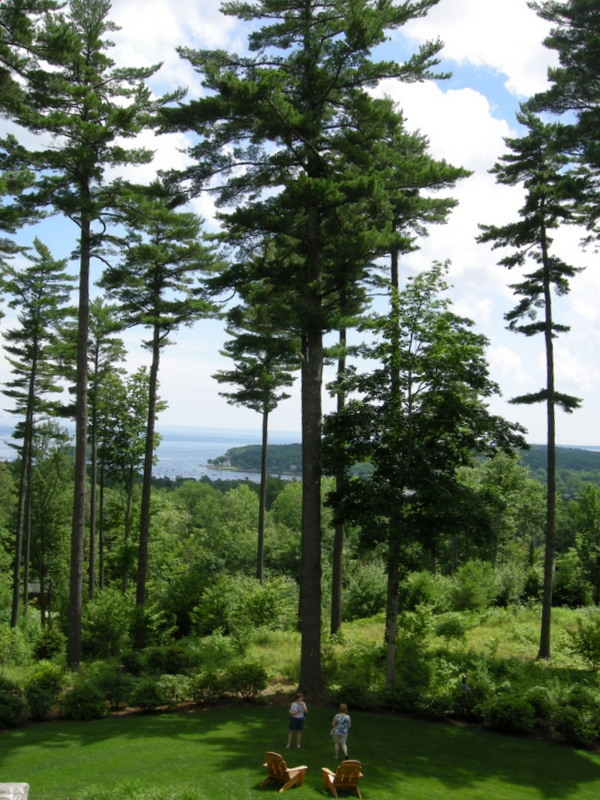 The tour brochure states that “the garden encompasses more than 5,000 trees and plants”, and every one of them was perfect, no brown leaves, no spent flowers, no unhappy plants. Looking up from the lawn area to the perennial gardens on the back side of the house. 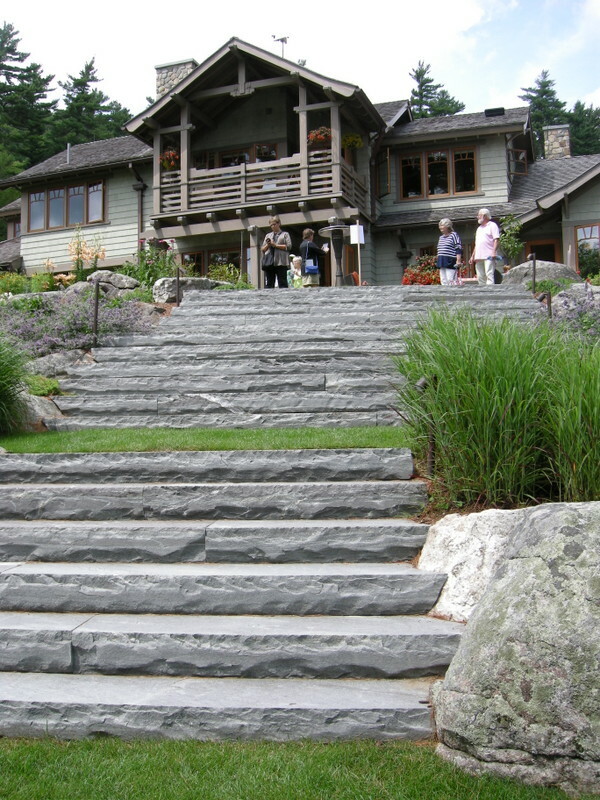 Everything about this property was massive, including the stairs from the lawn to the back terrace. Another gorgeous view from the back terrace. 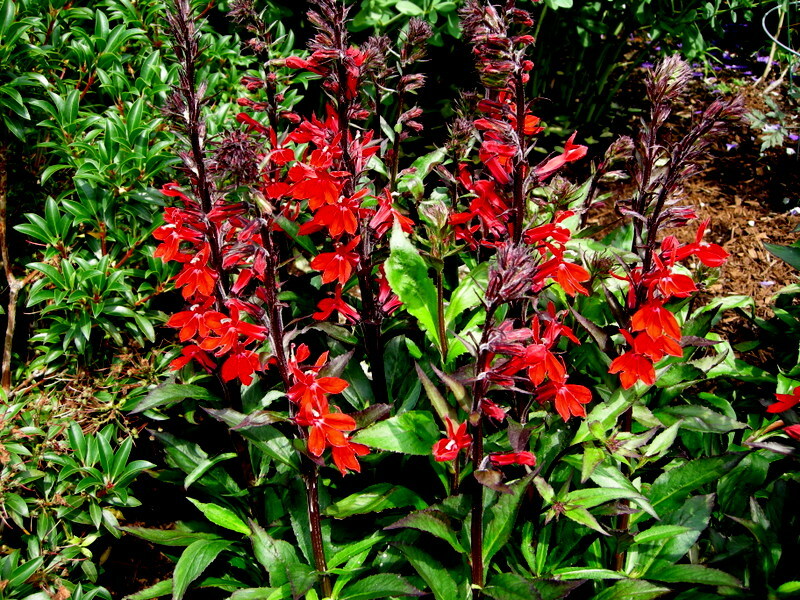 A plant that caught my eye ‘Fan Scarlet’ lobelia. 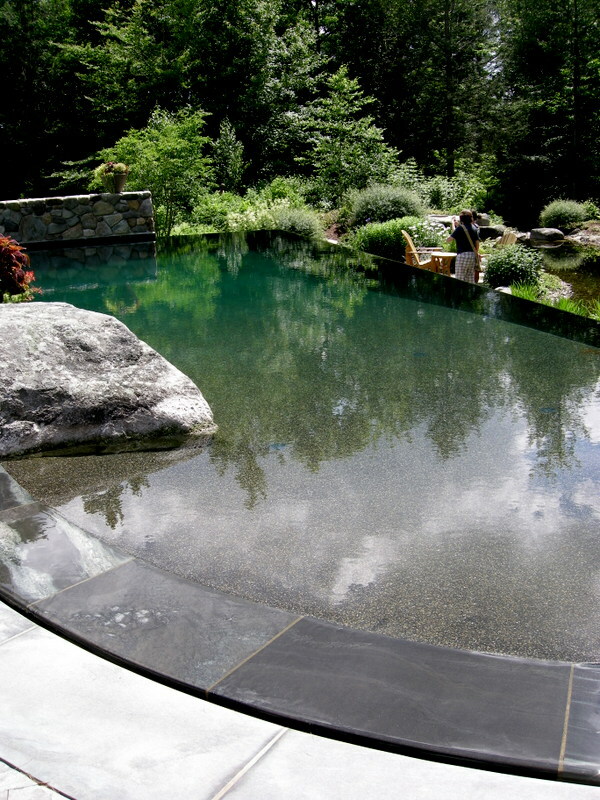 Granite boulders were incorporated into the design. In the last post in this series, I intend (if I have enough good photos) to show you some of the non-garden sights in the Camden-Rockport area and recommend a few wonderful restaurants. 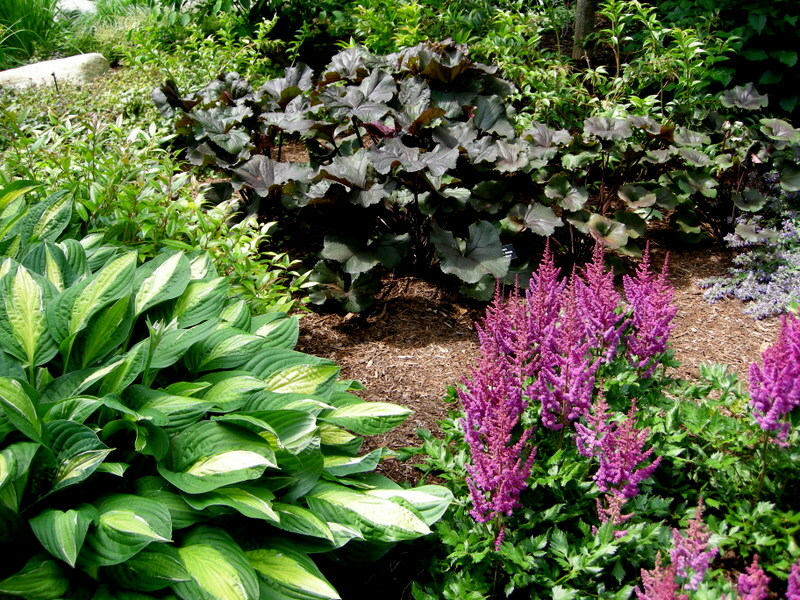 Nursery Happenings: Carolyn’s Shade Gardens is closed for the summer and will reopen in early September. If you are within visiting distance of the nursery and would like to receive catalogues and information about customer events, please send your full name and phone number to carolynsshadegardens@verizon.net. Subscribing to my blog does not sign you up to receive this information. 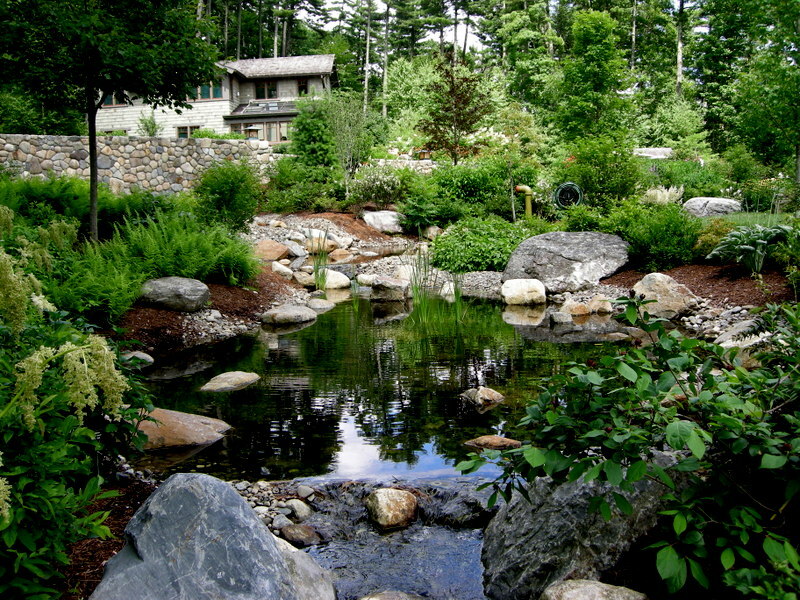 This entry was posted on August 13, 2014 at 6:10 pm and is filed under Garden Tour, landscape design, Maine, Uncategorized with tags Camden, Camden Garden Club, Camden Garden tour, Camden Harbor Maine, Camden House and Garden Tour, Camden Maine, Carolyn's Shade Gardens, Maine, Maine coast, maine gardens, Mid coast Maine, rockland maine, Rockport Maine. You can follow any responses to this entry through the RSS 2.0 feed. You can leave a response, or trackback from your own site. Wow, wow and wow Carolyn. The drive with the bridge and pond…then the entrance over the stream…those views of the gardens and woods and finally that pool. 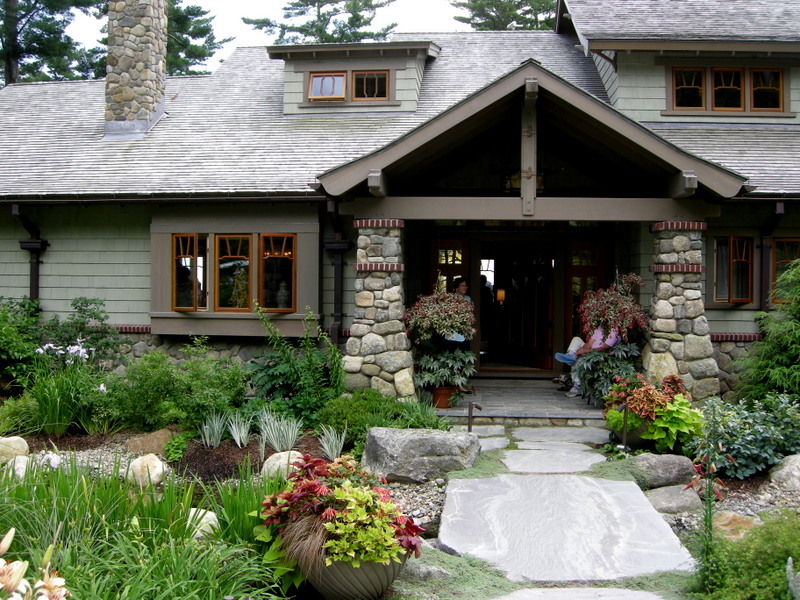 A dream home for me as I love Arts and Crafts homes. (You worked it out!) I like the paths, the pool and the stairs. Nice! I have had posts disappear too, but all I did was hit save again and it returned. Did you look in the drop down under Writing Helper? The arrow to the right is the drop down. I thought maybe you did when I talked with you. What did you think of the man-made stream, Carolyn? Did it feel natural or contrived? From your photo, it seems well executed & natural…and perhaps time will add more to give that sense. 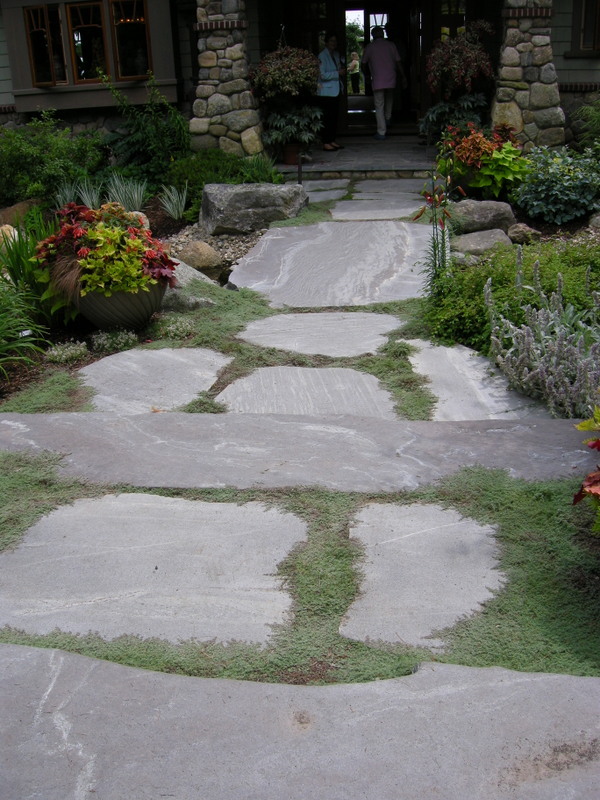 Did the entry walk cross the stream with a large stone or a constructed bridge? Did the stream funnel into a culvert or did it remain as wide as in the photo? 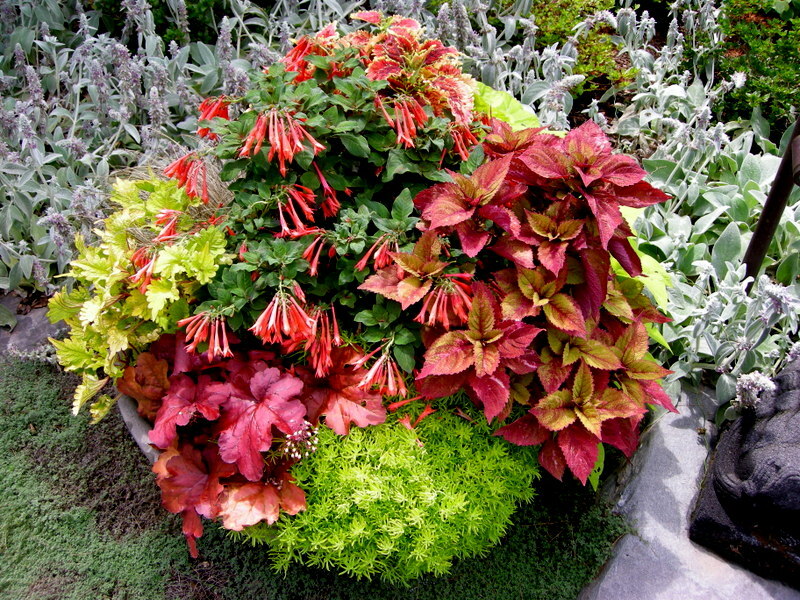 Carolyn, Do you know what the reddish orange trumpet like plant is that is in the lovely planter in this post? I could spend a few days there…. Not too shabby! 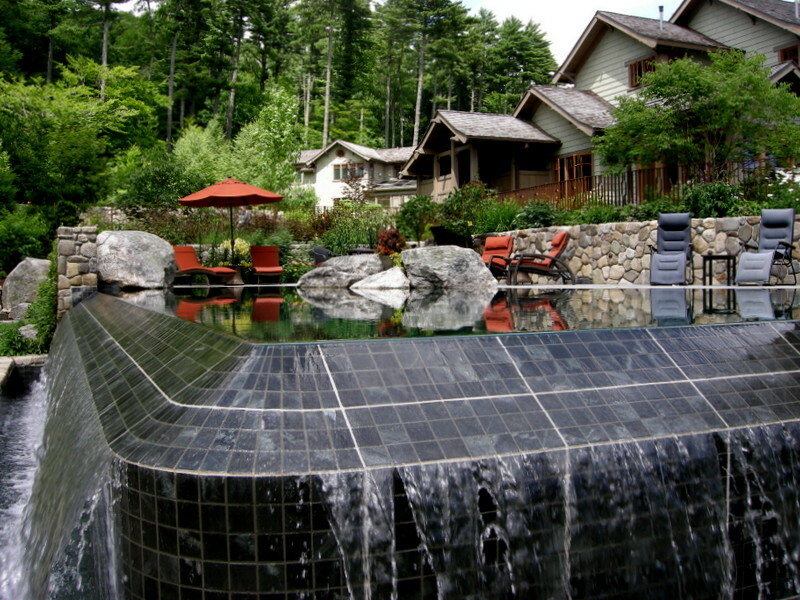 The pool is completely amazing and the stonework really sets off and adds to the house. I can imagine the steps out back settling in and aging with grass in the cracks and all kinds of summer wildflowers creeping in… The brand new manicured look is nice, but I like something summertime cozy and lived in. 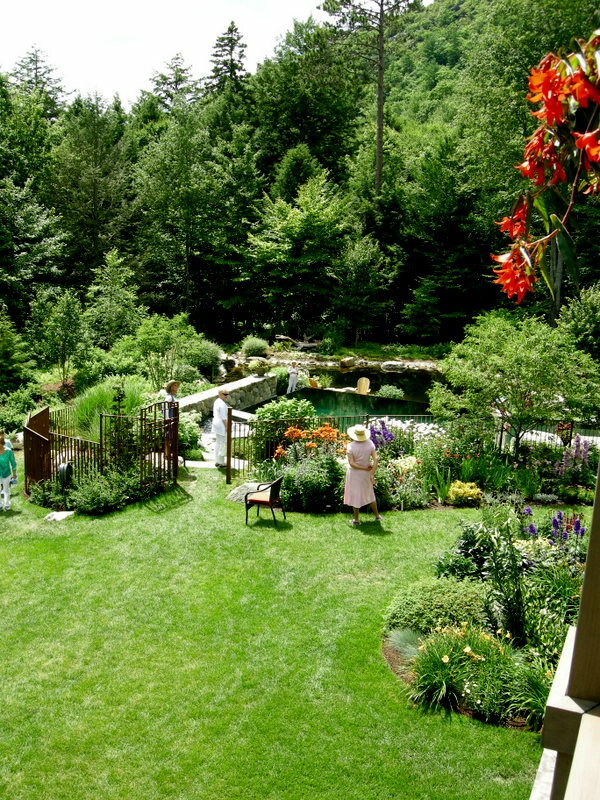 Oh wow–now that’s the kind of garden I want when I grow up. 😉 Seriously, everything is … perfect … without being too perfect! Simply sensational Carolyn, and I see you got a shot of the Queen looking over the pool area. Wow, what a view! But I do prefer the house and garden in part 3.